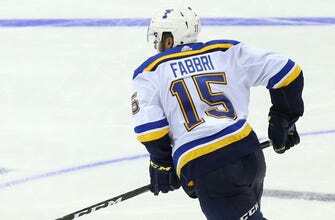 ST. LOUIS – Robby Fabbri has taken another step closer to a return to the St. Louis Blues. The 22-year-old forward is taking his rehab to San Antonio, where he was sent Wednesday on a conditioning assignment with the Rampage, the Blues’ AHL affiliate. He is recovering from back, hip and groin injuries he suffered during the preseason. Fabbri has said in recent days that he believes he’ll soon be ready for action with the Blues. He missed the end of the 2016-17 season and all of last season after blowing out his knee on two separate occasions, and his most recent injuries may have resulted from favoring the knee in preseason. Fabbri, the Blues’ first-round draft pick in 2014, has tallied 66 points (29 goals, 37 assists) and 52 penalty minutes in 123 career NHL regular-season games.